You are here: Virgin Islands News Online » News » Janice I.F Rymer in! Oleanvine Maynard out! Mrs. Rymer, a Virgin Islander, was the former Deputy Secretary within the Ministry of Natural Resources and Labour. She is the wife of local music legend Quito Rymer. 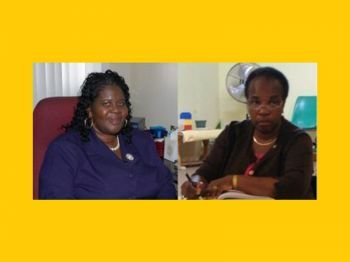 The new Labour Commissioner was confirmed to the post after former Commissioner of Labour Mrs. Oleanvine Maynard, another Virgin Islander, was one of the many casualties of the 2011 general elections that saw the NDP regime coming to power. Mrs. Maynard was among some 12 to 15 public officers at all levels in government who were allegedly forced out, transferred, fired, reassigned, sent on long leave or forced to retired with the backing and in many cases the directive of the NDP. While all the evidence continues to point overwhelmingly to the politicalization of the civil service and cementing that the institution is no longer merit based under the current government, Governor and Deputy Governor, one government Minister was not afraid to show his hands. At a community meeting held on January 19, 2012 at the East End/Long Look Community Centre, the always candid Deputy Premier and Minister for Natural Resources and Labour Dr. the Honourable Kedrick D. Pickering told the packed centre that he was the reason why Mrs. Maynard is out and took full responsibility. The 7th District Representative reported that there were too many complaints pointing in the direction of the Labour Commissioner Oleanvine Maynard which prompted him to have her replaced. He told the audience at the same meeting that he highlighted the issues to his Cabinet colleagues and admitted it was his decision to have Maynard removed. “I took the responsibility as the Minister. I brought it to my colleagues [and said] look this is the situation, we got too many complaints…if I am to move forward, I have to make a decision to move the Labour Commissioner. I take full responsibility for it,” Dr. Pickering had disclosed. 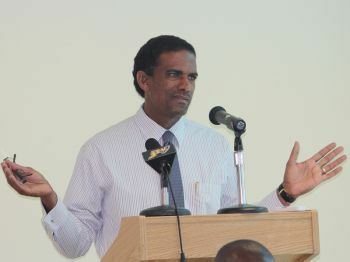 His statement was received with a loud applause, however, the Minister failed to disclose the nature of the complaints. Hon. Pickering first indicated the changes in the Labour Department on December 19, 2011 during a House of Assembly statement, weeks after it was firstly and accurately reported by this news site. He had stated that the Department that is responsible for the Labour force in the Territory will be restructured for greater efficiency starting from the top. The former Labour Commissioner was sent on leave weeks after the 2011 general elections and never returned to her office until she was forced to retire last year, another story firstly and accurately reported by this news site. In 2008, the Government Information Service announced Maynard's appointment as Commissioner of Labour, replacing Myrna Ferdinand. Mrs. Maynard replaced the late Wendell Potter. While many welcomed the swift confirmation of the new Labour Commissioner Mrs. Rymer to her post, other civil servants remained demoralized with the long acting post of others. They cite the acting Human Resources Director Michelle Donovan Stevens who has been acting for over three years, as well as Patrick O. Harrigan, at the Youth Affairs and Sports Department who has been acting for well over four years. There are many others, over 20 civil servants who are still acting in their post at different levels even after the post became vacant including Kelvin Penn Acting Chief Conservation and Fisheries Officer, and Mrs. Vansittart Huggins as acting principal for well over 5 years at the Eslyn Henley Richiez Learning Centre, just to name a few. Oh no, where can I get a flexible work permit now. Yes, I think she is less corruptible but we will see. Why state the headline as such...she been in, just not confirmed. CONFIRMMM???? If harrigan want to get confirm he better start going to Anglican church more often but not in Department of Youth Affairs and sports. "What goes around comes around!" When they kicked out Mr. Decoy Mactavious, putting the hard-working young man at a desk with nothing to do to frustrate him out of the department, after serving as Ag. Labour Commisioner, that was ok. Anyone acting in a position for more than 2 years was acting under the previous administration. This is nothing new. I acted for 5 years and still not confirmed in a position long before the current administration. I'm sure that there are many out there who can say the same. Ms. Maynard needed to go whichever administration was in, or whomever replaced her. As the Minister stated, there were too many complaints (and they were justified). She just needed to go. Ms. Rymer is a competent and fair person, and I wish her the best. Com on VINO. This news is old news. At least the new NDP is confirming officers in post unlike the past VIP and old NDP. Too many actors and actresses in this place. We soon need a village call Hollywood, but then again there are alot of them who already hauling somebody wood for power and money. Wha? You say "the institution is no longer merit based"? You got that donkey pushing the cart! Labour moving smoother and staff happier; no longer seeing 'certain people' walk through whilst others ignored. Best thing Hon Pickering has done! How is it that the Labour Laws only applies to some Employers and not ALL? Maynard tried to balance employer and employee relations, she was a fair administrator. No one is perfect, but we are jumping from the frying pan straight into the fire. They have done Maynard an injustice, shark e should sue dem backside. BVI people are a mean bunch. The same local civil servants asked for her to be moved and now acting like there's some big conspiracy. Same with other departments, Ministers acting upon the advice of staff etc. and then everybody pretending it's all politics. LOL!! She soon 60 so her stint will be short. I'm not too optimistic about the prospects for this nation. I guess the obeah man did not work ? I for one am pleased to see Ms. Rymer confirmed in the place of her predecessor ... It certainly seems as if the department is running more smoothly since she was ousted.